Designed to fit on the front of the FS-1000. This kit allows you convenient access to four color gels or to mix colors between the four. ADJ FS-6C Color Changer Adapter Kit for SPOT1000 is designed to fit on the front of the FS-1000! ADJ FS-6C Color Changer Adapter Kit for SPOT1000 allows you convenient access to four color gels or to mix colors between the four. The adapter mounts in the gel frame bracket located on the front of the spotlight. Insert 6.5 inches x 6.5 inches color gels and use them alone or in combinations. Color gels are not included with the adapter. 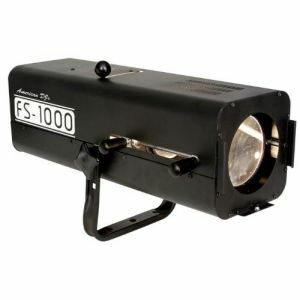 Your stage production will have endless possibilities in special lighting effects and colors with the ADJ FS-6C adapter kit added to your FS-1000 spotlight.